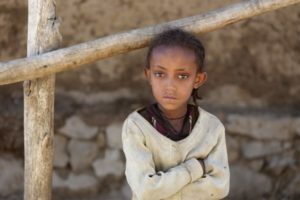 Bal Ej – the Hidden Jews of Ethiopia. Though it has been formally announced that with the last emigration of Falash Mura, there are no more Jews left in Ethiopia, there are still a number Jews living in Addis Ababa and the North Shewa region of Ethiopia, most of whom practice pre-Talmudic form of Judaism secretly. They split from the Beta Israel who settled in Northern regions of Ethiopia since Biblical times and even had the only independent Jewish Kingdom in the world. The migration of the Beta Israel from the area of Gondar to North Shewa was gradual with its pick in the 19th century. Beta Israel began their migration from North Shewa region to Kechene village in the northern part of today’s Adddis Ababa when Emperor Menelik II decided to move his palace from Ankober to Entoto and later to Addis Abbaba. Named Bal Ej, which means craftsmen, for for their skills in crafts, the community members played an important role in building the capital of Ethiopia Addis Ababa. Bal Ej of North Shewa and Kechene were forced to convert into Christianity. For centuries they have been persecuted by their Orthodox Christian neighbors who slandered them as buda or evil-eyed and hyena-people and have been deprived of the basic rights such as ownership of land, the reason for adopting crafts such as pottery, weaving and iron smithery. The stigma and discrimination persist till nowadays. Though they appeared Christians outwardly, inwardly they never abandoned Judaism and continued practicing Judaism secretly. Only recently, the youths of the community opened a synagogue in Kechene neighborhood of Addis Ababa where they hold their services openly; the rest of the synagogues are not visited by strangers and their location and practices are kept in strict secret. Because of persecutions, out of 40, only 15 cryptic synagogues have survived till today. In spite of the fears of murder and persecutions, Beta Israel of North Shewa keep faithful to their beliefs and ancient Hebrew traditions, some of which have been completely forgotten by the rest of the Jewish world. In her movie “Bal Ej: the Hidden Jews of Ethiopia”, Irene is lifting the curtains of hundreds of years and reveal the history, traditions and music of this remarkable community to the world. 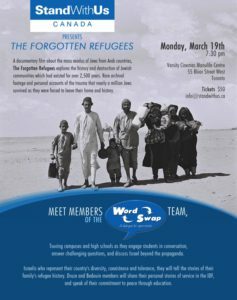 Come to meet members of the WordSwap Team, an event sponsored by StandWithUsCanada in both Toronto and Winnipeg, Canada. Jewish communities that existed for thousands of years in Arab countries were suddenly dismantled. The destruction of these communities is the subject of this documentary and evening devoted to archival footage and personal accounts of nearly a million Jews forced to leave their homes. 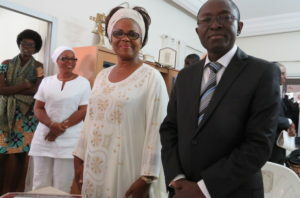 (JTA) — Avraham Yago, a married father of five who works as a linguistics professor at the University of Abidjan in the West African nation of Cote d’Ivoire, has visited Israel four times to learn about Judaism and practice his Hebrew. Yago, 64, grew up without any religious affiliation. As a teenager, however, he embarked on a religious journey that led him, by way of Christianity as well as studies at the Kabbalah Center in Abidjan, to Judaism. 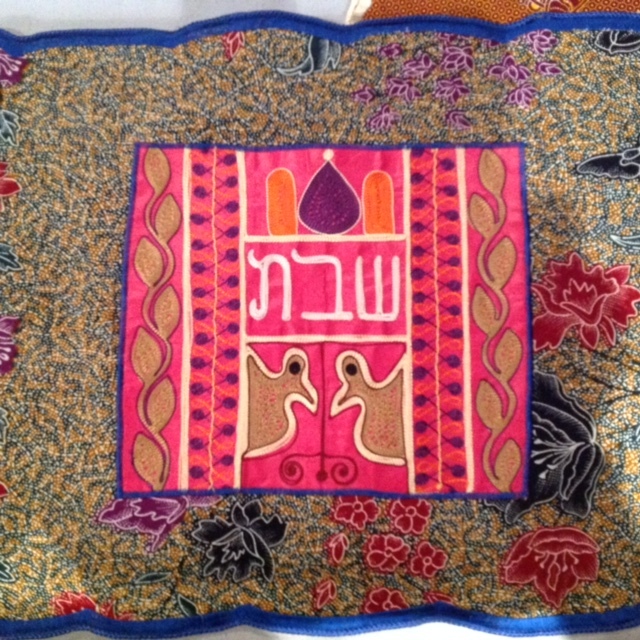 “For me, the Torah is the truth,” he told JTA from Abidjan, the country’s largest city. Several rivers come together in Suriname. It is also a place of cultural convergence. Though it is the smallest country in South America, bordered by French Guiana, Guyana, and Brazil, its population is one of the continent’s most diverse. Among its many peoples is a small community of Jews. Jewish history in Suriname began in the 1630s. In Portugal, the Inquisition left Jews no choice but to convert to Christianity, unlike the Spanish Inquisition which gave Jews the option to leave Spain. Those Portuguese Jews who could do so went into exile. Many escaped to Holland in 1600 where freedom of religion was introduced. From there, in 1639 and 1652, two groups of Jews made their way to Recife in northern Brazil, and on to what is now Suriname. The groups settled in Thorarica and Cassipora Creek, on the banks of the Suriname River. The Jews established sugar plantations which became the backbone of the country’s economy. In 1652, Sir Francis Willoughby, the British Governor-General for the West Indies claimed the country for England and recognizing the Jews’ importance to the colony, the British colonial government granted them special privileges: freedom of religion, permission to build synagogues and Jewish schools, the right to their own court of justice, and a private civic guard. These special privileges made Jews of Suriname the only Diaspora community ever to have complete political autonomy before the founding of the State of Israel. In 1664, after the French occupied Cayenne (French Guyana), a third group of 200 Jews followed the Amsterdam-born colonizer David Nassy to Suriname. In 1667, Holland and England signed the Second Breda Treaty. As part of the agreement, Suriname was given to Holland in exchange for New Amsterdam (today’s New York City) that went to England. The Dutch retained the special Jewish privileges. In addition, David Nassy was granted by the Dutch the right to establish a colony he called Jodensavanne, (Jewish Savannah), also known as “The Portuguese Jewish Nation” or “Jerusalem on the River”. The Jews from Thorarica and Cassipora moved to Jodensavanne. For over 100 years the Jews enjoyed freedom and prosperity. By 1737, Jews owned 115 of Suriname’s 400 plantations, and hundreds of slaves. The success didn’t last forever. Between 1765 and 1795, social, political, and financial changes caused the collapse of the plantation economy. Most Jews left the Jodensavanne and moved to the new Capital city Paramaribo, where they traded their agricultural past for new lives as professionals, merchants , artisans, and peddlers. In 1832 on Sept. 10, a fire raged through Jodensavanne, destroying everything, including the 147-year-old synagogue. The jungle has reclaimed what little was left. Today’s Jewish community is a remnant of the past, but is determined to survive. In 1999, the Sephardic and Ashkenazi Jewish communities merged, and changed from Orthodox to Liberal. There is no longer a rabbi; the cantor directs the services at the magnificent Neve Shalom Synagogue, built in 1835. In 2008, the community completed the renovation of the 148-year-old Mikvah with the help of donations. Currently, the community is made up of about 100 members. Recently, the community completed the renovation of the former Rabbi’s apartment, and it is now rented to tourists and guests, a tempting spot for a fascinating visit. Kulanu Canada is helping this historic community in many ways. 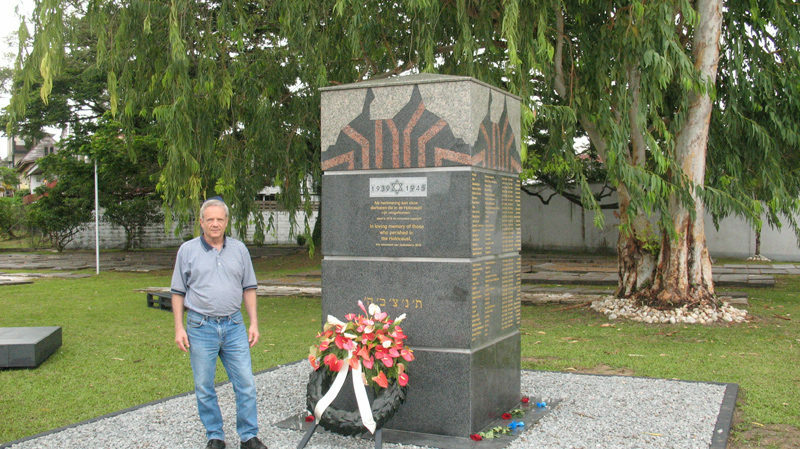 In 2016, Canadian funds helped to create a Holocaust Memorial Monument commemorating the 105 Surinamese Jews who died at the hands of the Nazis, and we’ve provided financial help to support the importing of matzoh and kosher wine for Passover.